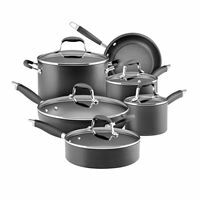 Set includes: 1-1/2- and 2-Quart Saucepans, 3-1/2-Quart Saucepot, 4-Quart Saute, 8-Quart Stockpot, 8-1/2- and 10-1/4-Inch Skillets. Durable three-ply construction features an aluminum core between layers of stainless steel for excellent heat distribution. Suitable for use on all stovetops, including induction; the polished, sophisticated stainless steel exteriors are easy to clean. 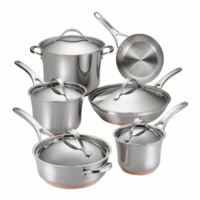 Comfortable stainless steel handles are dual riveted for strength; deep-seated lids seal in heat and moisture . Oven safe to 500 degrees Fahrenheit and Dishwasher safe. Includes: 1.75 Qt. & 3.5 Qt. 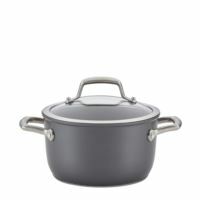 Covered Saucepans, 8.25 Qt. 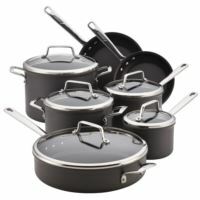 Covered Stockpot, 12" Deep Covered Skillet, 8" Open Skillet, & 3 Qt. Covered Sauté w/HH. Features polished stainless steel construction that's crafted with copper to deliver optimum heat control and performance. 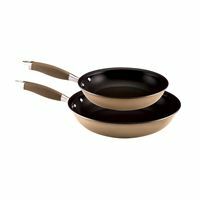 Double full cap bases feature copper cores layered between aluminum and magnetic stainless steel, so the cookware set is suitable for all cooktops, including induction. Oven safe to 500°F and dishwasher safe. This gourmet sauteuse features heavy-duty hard-anodized construction for commercial-quality heat distribution and superior culinary performance. 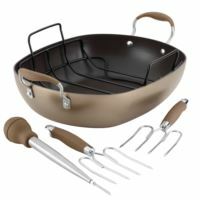 Dishwasher safe, with triple-layer premium nonstick interiors for metal utensil safe cooking with exceptional food release. Oven safe to 500 degrees Fahrenheit, the innovative triple-riveted Sure Rest(tm) stainless steel handle features a finger guard to boost control and stability. 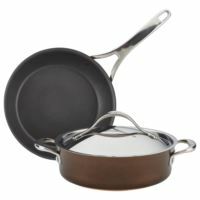 Features an elegant, shatter-resistant stainless-steel-rimmed glass lid to seal in heat and moisture. 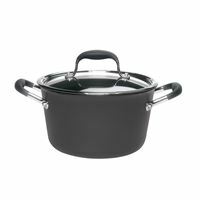 Hard-Anodized Precision Forge 3.5-Quart Saucepot. Constructed from hard-anodized aluminum using Precision Forge(tm) technology for ultimate durability. Triple-layer, metal-utensil-safe nonstick for premium-quality food release is dishwasher-safe for easy cleanup. 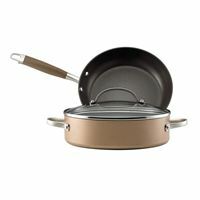 Dual riveted, cast stainless steel handle is flush with pan interior for a Unity Surface(r) free from protruding rivets. Oven safe to 500°F and suitable for all stove tops, including induction. Dishwasher safe. 4.5 Qt. Covered Tapered Saucepot. Hard-anodized aluminum with Autograph nonstick coating inside and out. SureGrip riveted handles constructed from stainless steel and silicone rubber. Break-resistant, domed glass lids permit cooking to be easily monitored. Oven-safe to 400 degrees F; hand wash recommended. 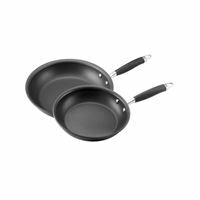 Twin Pack: 10" & 12" Open Skillets. Hard-anodized aluminum with Autograph nonstick coating inside and out. SureGrip riveted handles constructed from stainless steel and silicone rubber. Oven-safe to 400 degrees F; hand wash recommended. Twin Pack: 10" & 12" Skillets. Twice as hard as stainless steel, this hard-anodized construction is preferred for its extraordinary durability and fast and even heating, reducing hot spots-inch that can burn foods. The graceful tulip shape brings a touch of elegance to any kitchen. The Anolon Suregrip handle is a comfortable combination of stainless steel and silicone, dual riveted and oven safe to 400°F/206°C. 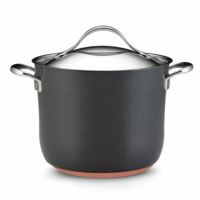 This versatile saucepan features durable, hard-anodized construction crafted with copper to deliver optimum heat control. 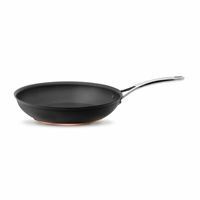 Double full cap base includes a copper core layered between aluminum and magnetized stainless steel, making it suitable for all cooktops, even induction. Restaurant-tested nonstick delivers long-lasting food release and easy cleaning, and is metal utensil safe. Oven safe to 500° F. Hand Wash. Stovetop Suitable for Induction, Solid Plate, Ceramic, Gas, Radiant Ring, Halogen. 8.5in and 10in Open Skillets. Hard-anodized construction crafted with copper to deliver optimum heat control. 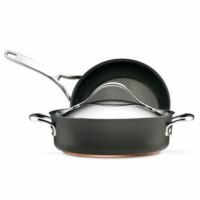 A double full cap base includes a copper core layered between aluminum and magnetized stainless steel, making it suitable for all cooktops, even induction. 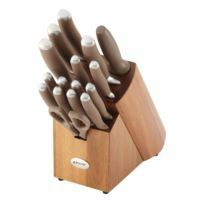 Metal utensil safe Autograph® 2 non-stick delivers effortless food release with fast cleanup. 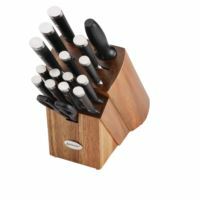 Cast stainless steel handle with flat-rivet technology. Oven safe to 500° F.
1.5 Qt. & 3 Qt. Covered Saucepans, 8 Qt. 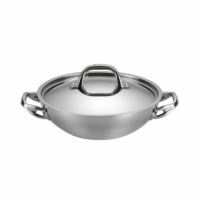 Covered Stockpot, 8.5" Open Skillet, 12" Covered Deep Skillet with HH, 3 Qt. Covered Sauté. Hard-anodized aluminum with Autograph nonstick coating inside and out. SureGrip riveted handles constructed from stainless steel and silicone rubber. Break-resistant, domed glass lids permit cooking to be easily monitored. Oven-safe to 400 degrees F; hand wash recommended. 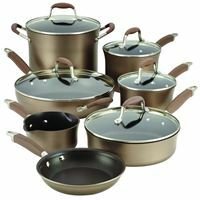 Set Includes: 9.5" French Skillet & 3 Qt. Covered Sauteuse w/Swing Lid. 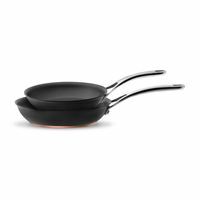 Heavy gauge, hard-anodized construction ensures efficient, even heat distribution for exceptional gourmet cooking performance. . 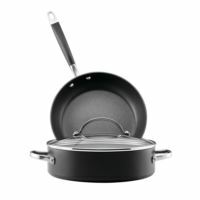 Rugged DuPont Autograph 2 nonstick surface inside and out allows you to cook with less oil, making it ideal for healthy cooking and easy cleanup. 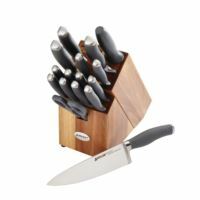 Autograph 2 delivers superior durability that stands up to the rigors of a professional kitchen and is metal utensil-safe. Oven-safe to 400 degrees F; Hand wash.
1.5 Qt. & 3 Qt. Covered Saucepans, 8 Qt. 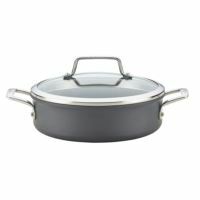 Covered Stockpot, 8.5" Open Skillet, 12" Covered Skillet, 3 Qt. Covered Sauté with Helper Handle. Hard-anodized construction crafted with copper to deliver optimum heat control. 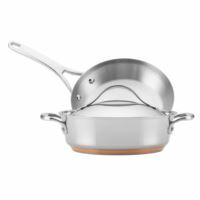 A double full cap base includes a copper core layered between aluminum and magnetized stainless steel, making it suitable for all cooktops, even induction. Metal utensil safe Autograph® 2 non-stick delivers effortless food release with fast cleanup. Cast stainless steel handle with flat-rivet technology. 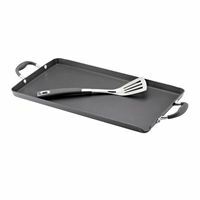 Oven safe to 500° F.
18" x 10" Double Burner Griddle with Pour Spout & Mini Stainless. 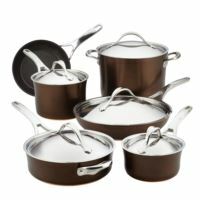 Hard-anodized aluminum with Autograph nonstick coating inside and out. SureGrip riveted handles constructed from stainless steel and silicone rubber. Oven-safe to 400 degrees F; hand wash recommended. Set Includes: 1.5 Qt. & 3 Qt. Covered Saucepans, 8 Qt. Covered Stockpot, 8.5" Open Skillet, 12.5" Covered Skillet, 3 Qt. Covered Sauté with Helper Handle. Hard-anodized aluminum construction boasts an induction plate with copper midlayer for fast, even heating. Flush rivets provide smooth cooking surfaces that look sleek and prevent food buildup. 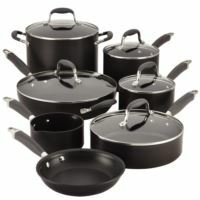 Dishwasher-safe cookware features premium PFOA-free nonstick for exceptional food release and effortless cleaning. 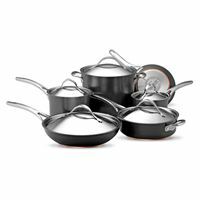 Deep-seated stainless steel lids and durable cast handles are oven safe to a 500 degrees F.
Set Includes: 10" Open Skillet & 3 Qt. Covered Sauteuse w/Swing Lid. 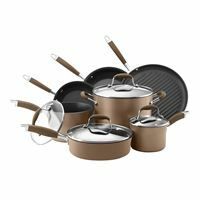 Hard-anodized aluminum construction boasts an induction plate with copper midlayer for fast, even heating. Flush rivets provide smooth, uninterrupted cooking surfaces that look sleek and prevent food buildup. 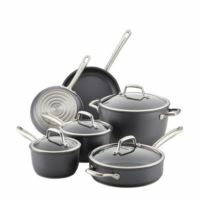 Dishwasher-safe cookware features premium PFOA-free nonstick for exceptional food release and effortless cleaning. 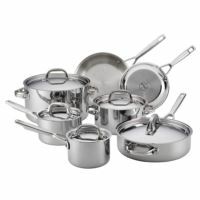 Deep-seated stainless steel lids and durable cast stainless steel handles are oven safe to a ripping 500 degrees . 1 Qt. 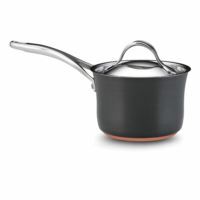 Open Saucepan w/Spouts, 2 Qt. & 3 Qt. Covered Saucepans, 8 Qt. Covered Stockpot, 8" Open Skillet, 12" Covered Deep Skillet w/HH, 3 Qt. Covered Sauté. Twice as hard as stainless steel, this hard-anodized construction is preferred for its extraordinary durability and fast and even heating, reducing hot spots-inch that can burn foods. The Anolon Suregrip handle and oven safe to 400°F/206°C. Oven-safe to 400 degrees F; hand wash recommended.